I picked up a little entryway table a while back for the big fruit and veggies shoot I did a while back. And always planned to eventually repaint it. I liked the shape, but wasn’t a huge fan of the distressed grey look…doesn’t really fit the mid-century inspired shape. 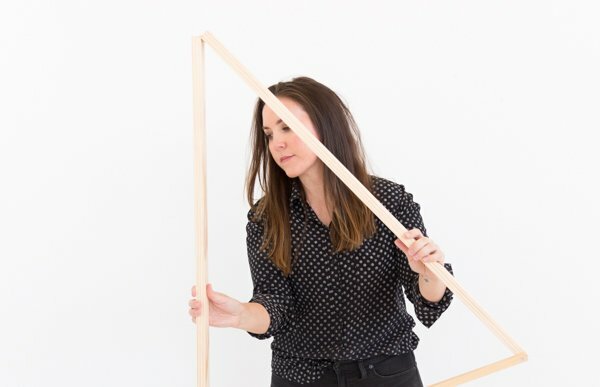 From the start, I knew exactly what I wanted to do with it (the color combo, the type of hardware I was looking for, etc) – which I have to admit doesn’t happen all that often. I do a whole lot more ‘winging it’ than I probably care to these days. But for this one, I knew what I wanted it to be. 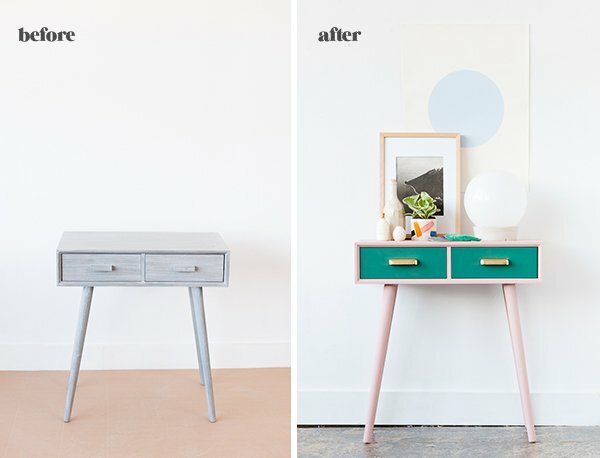 And after mixing paint colors to get the exact matches I was picturing, it all came together in what is officially my favorite furniture makeover to date. I did some light sanding first, just to prep the surface for paint really well, and wiped off any debris with a dry cloth. Then, I removed the drawers and removed the hardware from the drawers. And then I started mixing colors. I have A LOT of paint at the studio, but we’ve used all the colors I have for the most part on one thing or another already. So instead of going out and buying more paint, I decided to mix my own. Which actually was one of my favorite things to do when I was still painting regularly. It’s probably also why I care so much about color palettes these days. Anyway, after mixing 3 or 4 interior paint colors for the mauve color and 4 or 5 for the emerald green color, I was ready to start painting. It might be hard to tell that I mixed my own colors for this project, based on the one and only photo we got of the mixing, but I promise I did. 🙂 I used an old paint swatch as a guide for the colors I wanted to mix, and it only took a few minutes to figure out. 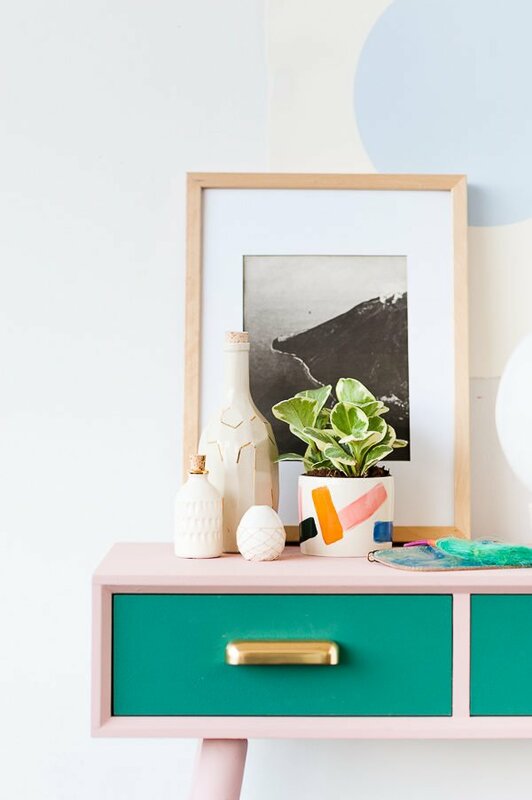 Tips for mixing your own paint colors… 1) Make sure all of the paint finishes are the same (all the paints are flat, or all eggshell, etc). 2) Make more than what you think you’ll need because the chances of you getting an exact match again if you need just a tiny bit more are very slim. *That also means you may need to mix your paint in an airtight container (or pour it into later), so that it doesn’t dry out in between coats. Use a roller for any flat areas to avoid brushstrokes and a brush for any areas that aren’t flat or are hard to get to with a roller (i.e. legs). Wait for the paint to dry, then apply a second coat if necessary. Sand in between coat if necessary. 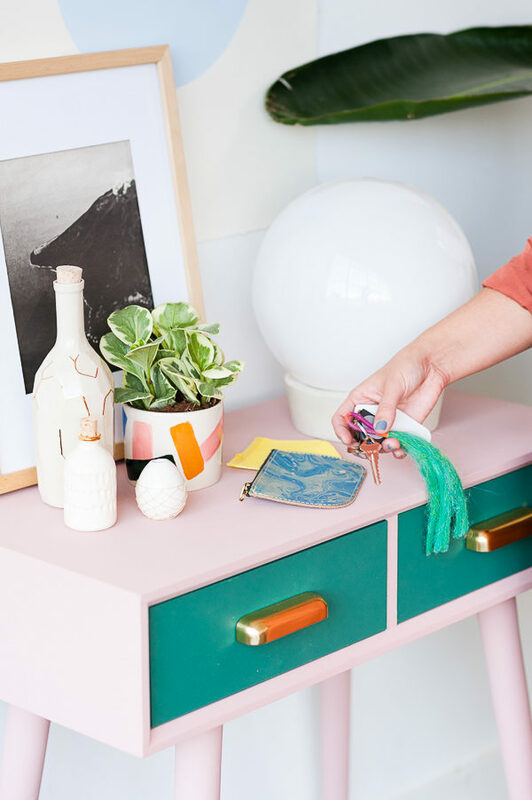 Once dry, add new hardware to drawers, if desired. I went with two larkin bin pulls from Rejuvenation in aged brass (they’re on sale right now!). Put the drawers back in and you’re done. What do you think? Are you a fan of how this one turned out? What do you think of the color combo? This color combination is giving me the biggest heart eyes I’ve ever had!! Turned out so well! I’m too afraid to try and mix my own colors but you did an amazing job! Aw, thanks Catherine! 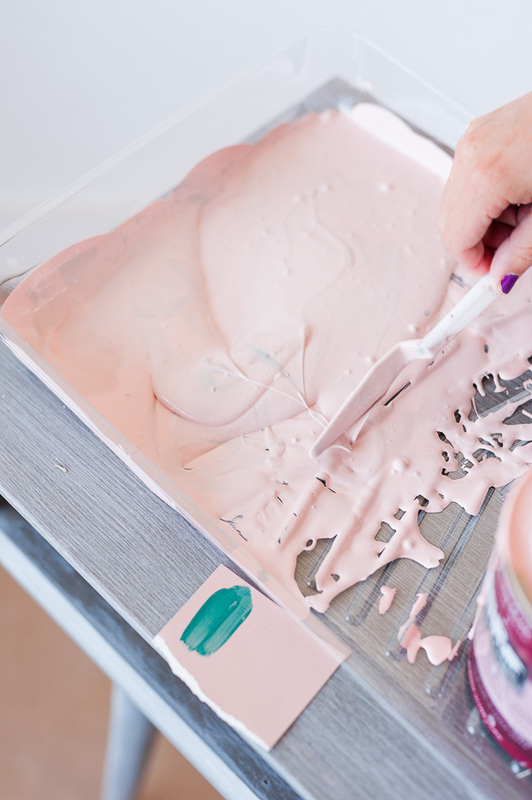 🙂 The paint mixing is really a lot easier than it may sound, but I can understand how it could feel a bit intimidating. You should give it a try on something small and see how it goes. I love this! Do you have a source for the original table? I’m looking for something exactly like this in the entryway at my house. Thanks Sarah. Of all places, I actually got it at Home Goods locally in Atlanta a couple of months back. I hardly ever go in there, but I’m glad I stumbled on this guy that day. Fingers crossed you can find something similar. The makeover looks fantastic, I love the green and pink contrast! Well done! Thanks Michelle. This color combo was one of my faves in a while too…works well for fall. This is absolutely stunning. 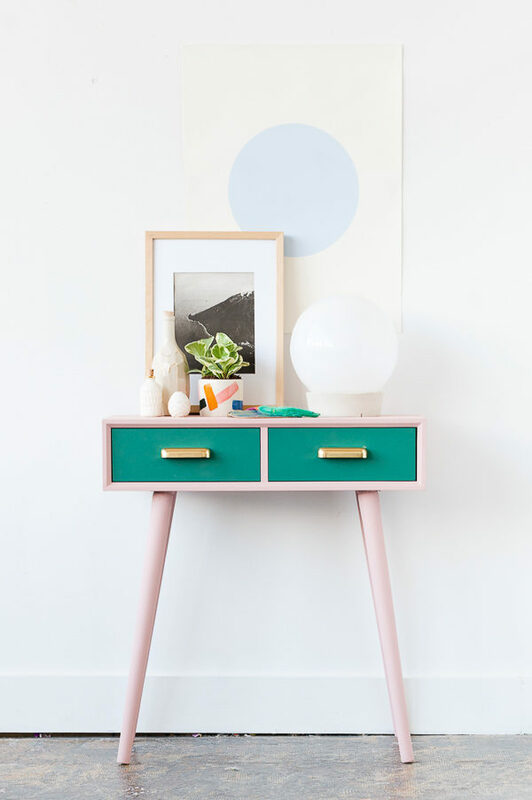 Love the colour combo, I adore the handles and just wow at the styling. Arghh I wish I was this talented!!! Thanks so much Carly. What a sweet thing to say. 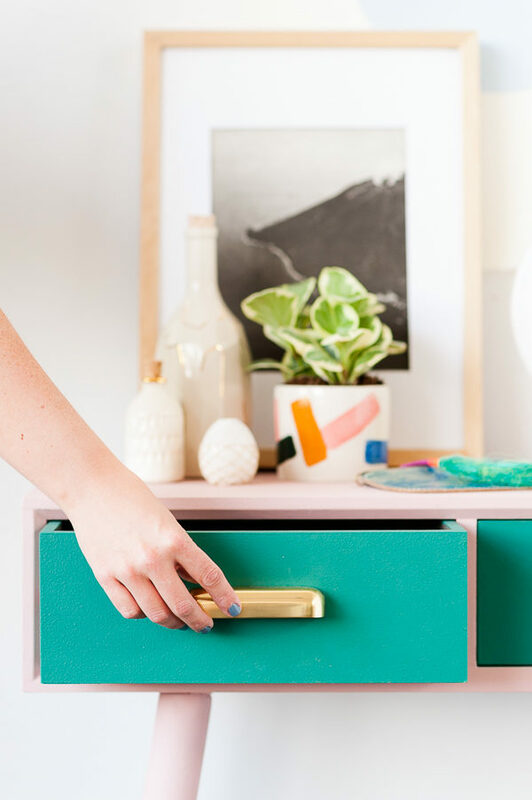 The brass drawer pulls definitely help to pull it all together. Love it! Love it love it love it. Your eye for color is insanely good. 🙂 Aw, thanks Kathleen. I really, really appreciate that. Thanks My Little Crafty Life! I’m obsessed with this color combo! I love how you styled it too! Your taste for color is truly remarkable! I absolutely love it! Aw, thanks Amy. That’s so kind of you to say. 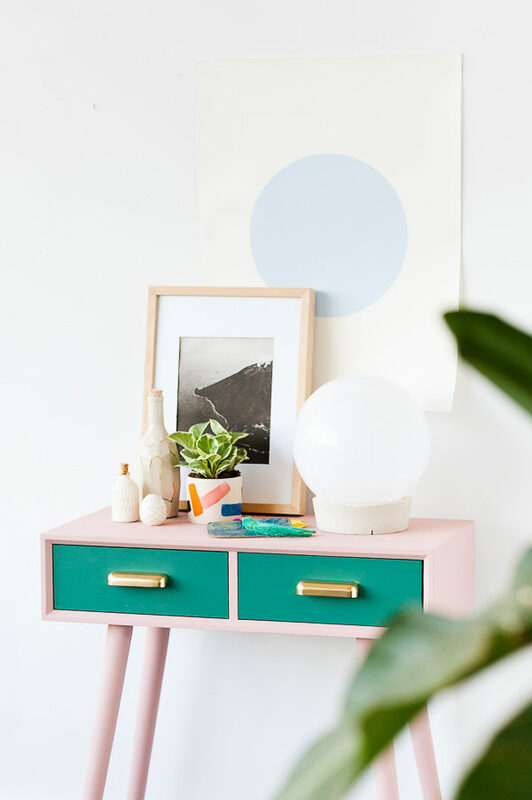 I love that entry table you gave a makeover!! It’s gorg. Sleek but with personality. Where did you get it? I read in a post you were going to Houston. I live in Houston. Do you have any suggestions for places in Houston I could go scouting for vintage or mid-century pieces? I’d like to find a piece and re-do one myself. 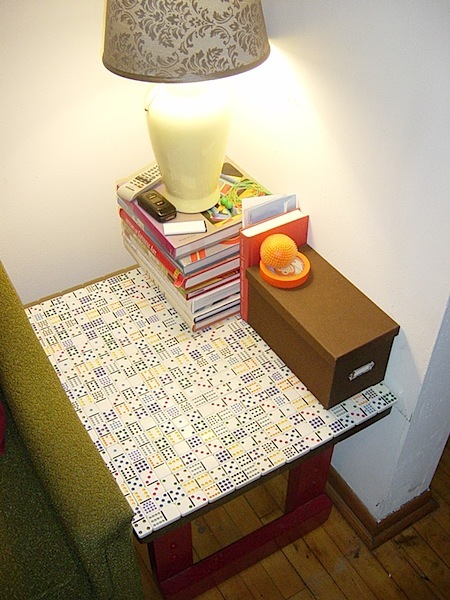 I love what you did with the table. 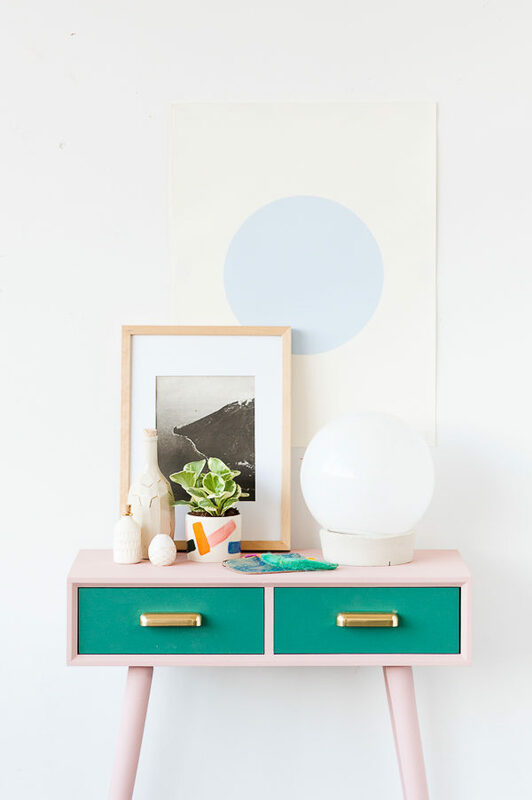 And I’m absolutely crazy about the white globe lamp. Will you please tell me where you purchased it?